Sometimes you might intend to limit users’ access to certain applications in the computers for common usage in the office or at home for some reasons. For instance, you do not want your kids to access Windows Live Messenger or you do not want your office staff to simply update some Microsoft programs, skype, etc. In this case, a portable blocking application such as AppAdmin will be helpful. AppAdmin is a free and portable blocking application that can be used to block the desired applications from being executed. This user-friendly application makes application blocking easier with just a few steps. Users simply need to drag and drop the selected application to the software itself. Alternative, users can click on the “Block” button and select the applications that they intend to block. Once users have selected the intended programs, they can set a valid password to deny access by unauthorized users to the programs. Users can unblock the blocked application easily by clicking on the unblock button. 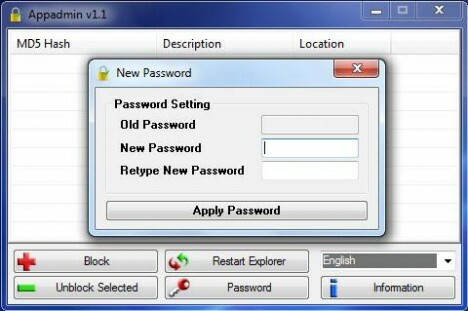 This program also offers a “Restart Explorer” mode whereby users who cannot find the blocked programs just need to restart their Explorer instead of restarting their computer. AppAdmin uses the Hash method. Hence, users cannot simply break or change the banned application`s exe name through gpedit.msc, etc. Users who are authorized to access the banned application need to go to AppAdmin to unblock it first before they can run this banned program. This limitation probably is one of the major setbacks to this free application at this moment. AppAdmin support and compatible with most of the Windows OS version, e.g. Windows XP, Vista, Windows 7. Users can download this blocking application, AppAdmin.